Today was one of those days that are not supposed to happen in Ireland. The temperature reached 27 degrees in Ennis with clear blue skies. The country went a little crazy – wherever you looked you were dazzled with displays of white skin with guys taking their t shirts off and girls wearing skimpy shorts that clearly don’t get much use. 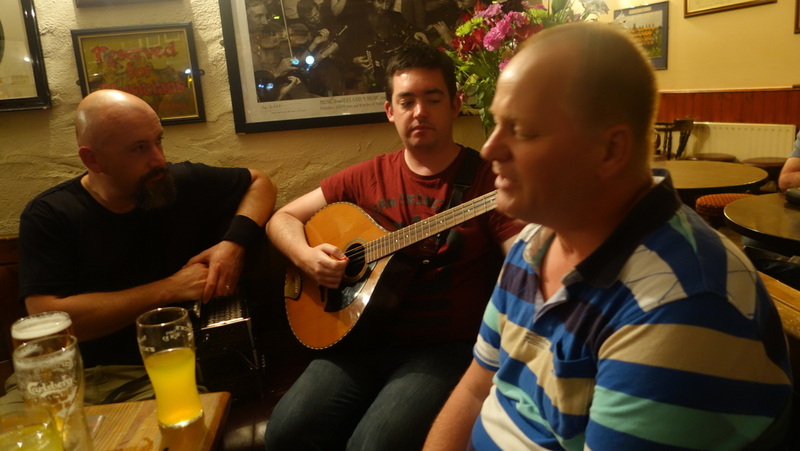 That evening I decided to drive the half hour to Doolin to sample again the session at Gus O’Connor’s. I have written a lot about Sessions but this one is different. 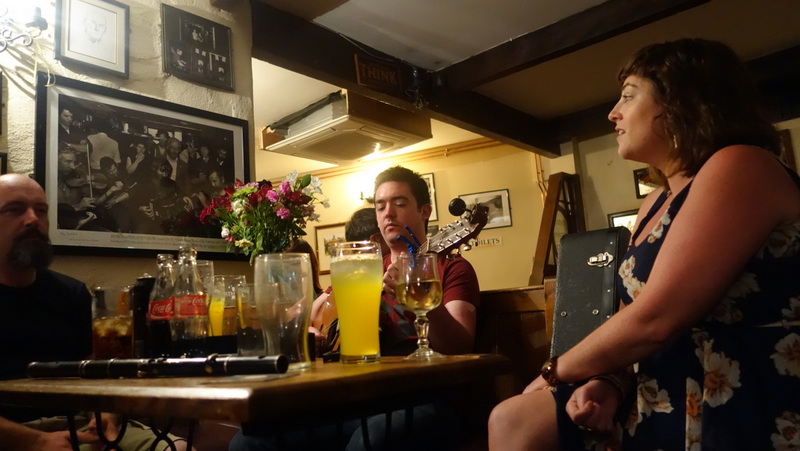 For the most part the sessions in Ennis are ignored by the punters who just talk louder so they hear themselves over the top of the music. Or the pub might be nearly empty and silent with people politely applauding after every number. At Doolin, O’Connor’s is always chock a block with tourists. The pub does a roaring trade on the back of Doolin’s reputation for trad music. I had been reluctant to go there because of the perception that the ‘real’ Doolin had gone but I thought I’d give it another go. 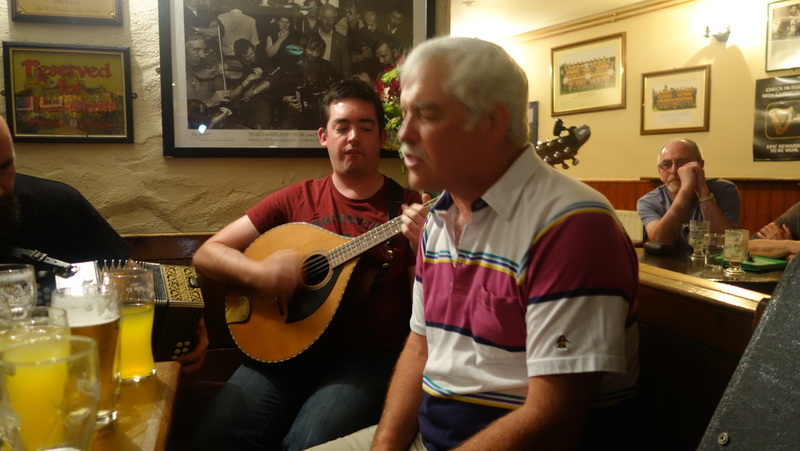 It was Noel O’Donoghue on flute and Seanie Vaughan on box with Brian Mooney on bouzouki. It didn’t get off to that good a start when Noel whispered across to me that they were in Eb and he suggested I retune the fiddle. I had never done this before and it took a while as they got sick of waiting for me to and started playing. Eventually sorted and I could join in. The music was great – fast and tight. Then Ted McCormack (who seems to be a regular) arrived and sang a few songs. I got chatting to a family from Virginia, Mike and his three daughters (Kate Jenny and Ciara) here in Ireland for nine weeks. They come every two years and have been since the girls were babies. Lucky girls! 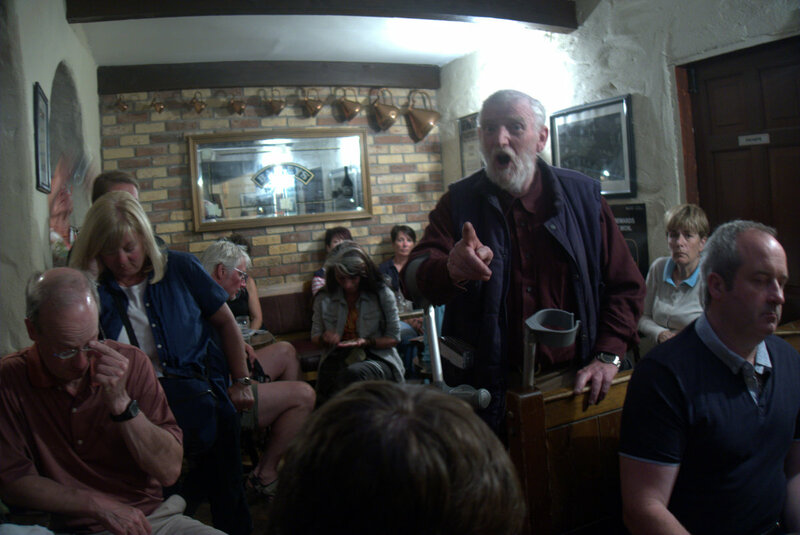 Seanie persuaded Mike to sing a song and he did an excellent rendition of Bold Thady Quill after which his eldest daughter Kate sang Spancil Hill. 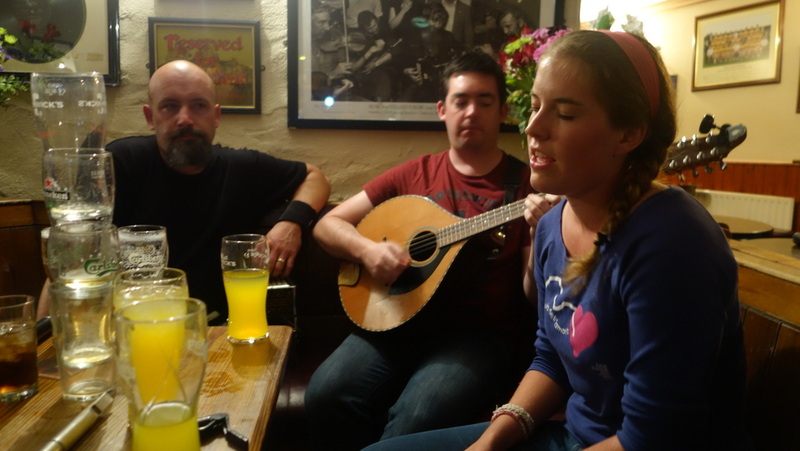 Takes courage to get up in front of a crowded pub and sing. No doubt they will take away priceless memories. This started a progression of songs from the audience including Frits from Holland, with two lovely Irish ballads, an Irish guy with Band Played Waltzing Matilda, myself with Jim Jones and Níamh from Mallow in Cork who sang Caledonia. There was a great atmosphere and the punters appeared well satisfied. 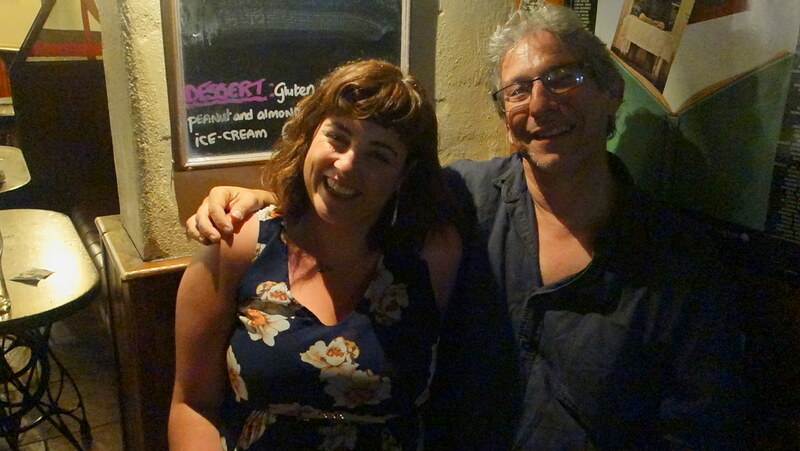 I went over afterwards and had a chat with Niamh and her friend Tina They were in Doolin on holidays which was great. Irish touring Ireland. They delighted in telling me there address was Newtwopothouse Mallow (is there an Oldtwopothouse Mallow?) and Tina wasted no time in telling me I should visit Kinsale and her sister’s restaurant for a fine dining experience. They were great crack as they extolled the virtues of Cork City over Dublin and why it should be the capital of Ireland and what was wrong with Perth in Western Australia and their views on the Irish living there and anything else that came to mind. The night finished at 1.00 am and I headed home along empty roads with a giant glowing half moon sitting just above the horizon. But the night wasn’t completely over! A few kilometres outside Ennistymon I was flagged down by a guy who said he was walking from Ennistymon to Ennis a distance of twenty something k’s. Against my better judgement I picked him up and he explained that there had been some trouble, a fight or something, in Ennistymon and the Garda had told him to get out of town. This did not sound promising. He was trying to phone his wife who had the car and was pregnant and…yes I learnt a lot about Dylan and Siobhan in that few minutes. Eventually he made contact with her and they then proceeded to have a domestic over what he did or didn’t say to a friend at a party. The conversation was pretty intense but I could only hear one side of course. It didn’t take much to fill in the gaps between the ‘you fecking eejit’s that filled the car . There was then a convoluted discussion with her about getting me to drop him at the brown house in a remote village where the drugs were and that he had the 300 euros. Now I was really concerned. Anyway we finally we found a house he was happy to be dropped at and he disappeared into the black……I was glad to be shot of Dylan and got safely home at 2:00am. Ireland continues to surprise. Sounds like a cracking good night and your opening paragraph regarding the hot weather and the standard of dress or undress 😄 reminds me of last summer when we were home in Ireland. Great reading and pictures! Oh and have you thought of filming some of the songs and music? My wife is from County Longford and we are planning to go back soon to live there for a year or two before our daughter has to start school. Recently I started a Fb photography page about an Australian discovering Longford. I’ve mostly posted photos but I’m starting to write a little bit about my adventures there to accompany the photos. The locals have been very receptive to my page and I now have over 500 likes and my ‘likers’ are making regular comments too. I’m going to start a blog soon so it will be interesting to see how that goes. Anyway keep writing your blog because stories about travelling around Ireland are always entertaining…loved that bit about your druggie hitch-hiker. I checked out your Fb page but it’s a personal one. Have you thought about creating a page for your photos? Here is mine for you to have a look at anyways … John. Ps I have the 5D too but really enjoying using my iPhone 5 at the moment. That’s one big plus about FB, people sharing your posts or photos onto their page and then all their friends and family will see and read your posts. Regarding the watermarking of photos. I use Lightroom at home and a very cheap app called Photogene when I’m on the road. You can download it onto your mobile device such as iPad or iPhone. Not sure if you can download apps onto laptops. There are probably other photo editing apps as well that have the water marking feature. Why do I water mark my photos? Well as I said, on Fb, people tend to share your photos which is find because it will say shared from such and such page but every now and again, people will download your photos and then add them to their page as if they were their own photos 😦 so that’s when water marking is useful.